There are many children who are Mavericks, but have been diagnosed with autism or other mental disorders. Dr. Florance has seen this over and over again in many years of practice. Although the symptoms can look the same, the right help can make a big difference for the Maverick Mind and can give hope of becoming symptom-free with appropriate training. Often the symptoms of a Maverick are similar to symptoms of Autism or Attention Deficit Disorder (ADD). Misdiagnoses frequently lead to frustration, acting out and appearance of no motivation. Some Mavericks are diagnosed as gifted in certain situations. When Mavericks are correctly identified and begin appropriate training, they often experience success very quickly. What is the Visual Brain? Do you have a dominant visual brain? What is a Maverick Mind? Many Visual Thinkers have severe language and communication problems and are often diagnosed with Autism, ADD, and other mental disorders. These individuals are referred to as Maverick Minds by Dr. Cheri Florance. 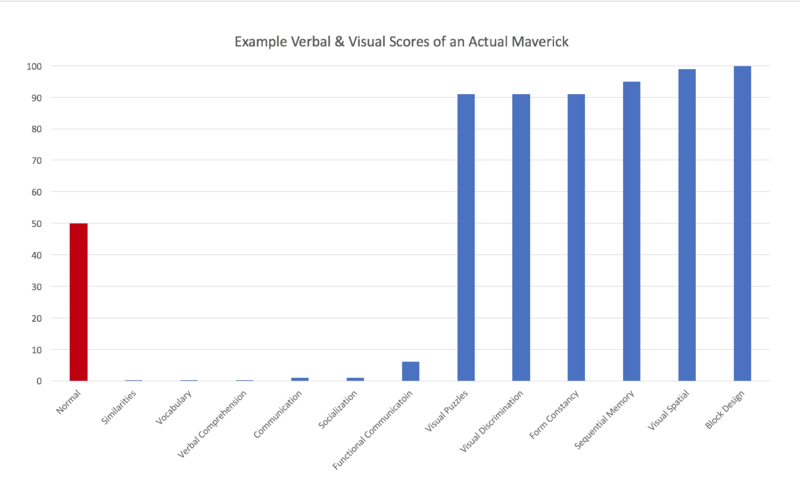 A Maverick brain functions at above the 99th percentile in the visual pathway and below the 1st percentile in the verbal pathway. However, testing of visual thinkers can be very complex. Mavericks have such strong visual thinking that an enemy relationship has formed between picture thinking and words. Get your FREE Information Session! Are you a good fit for the program? The visual thinker symptoms are all related to attention, memory, listening, reading, speaking, and writing. Dr. Florance’s research in brain science included devising tests that identify the characteristics of a strong visual brain. Dr. Florance has designed an assessment that can clearly identify the highly visual thinker – the Maverick. Do strong visual brains run in your family? Are you concerned about problems with communication? There are 50 symptoms that characterize a Maverick. Find out how many you have. At least one parent and sometimes several grandparents are in professions and jobs that require a strong visual brain— engineers, surgeons, architects, designers, computer analysts, and entrepreneurs. Our programs are designed to analyze highly visual thinkers in the family tree, it’s our most critical predictor of success. Want to speak with the expert?